The Green Bay Packers Upper Level describes the majority of seats on the top bowl of non-premium seating at Lambeau Field. The Lambeau Field seating chart shows the Upper Level in all sections on the 300 level other than the Upper Sideline. Green Bay Packers Upper Level seats are spread into many different sections: section 300, section 301, section 302, section 303, section 304, section 305, section 306, section 307, section 308, section 310, section 312, section 314, section 316, section 318, section 320, section 332, section 334, section 336, section 338, section 340, section 342, section 344, section 345, section 346, section 347, section 348, section 349, section 350, section 351, section 352, section 353, and section 354. The view from seats in the Upper Level is dependent upon specific seat and section location. The spots close to the 50-yard line and the front rows offer clear, unobstructed views of the whole field. Back row seats in end zone sections provide spotty, mediocre views of the anything beyond the close end zone. 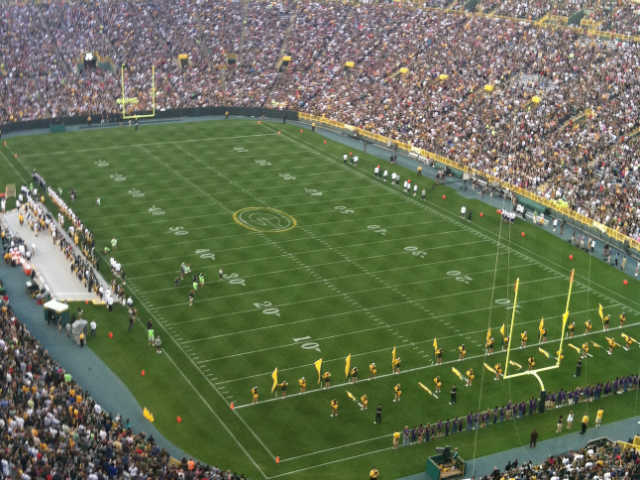 Packers Upper Level tickets are sold in two different price categories based on their section location. Sections close to the 50-yard line are in the more costly category while corner end zone and end zone sections are in the cheaper group. Unfortunately for casual fans, all Packers Upper Level tickets are sold as full season tickets with single tickets rarely offered by the Lambeau Field ticket office. Buyers shopping for individual game tickets should look to ticket broker websites and third-party ticket vendors for any hope of finding a group of tickets for popular games.